Kendo is a Japanese style of fencing derived during the Meiji period in Japan (1868-1912), from the two-handed sword fighting techniques of the samurai. 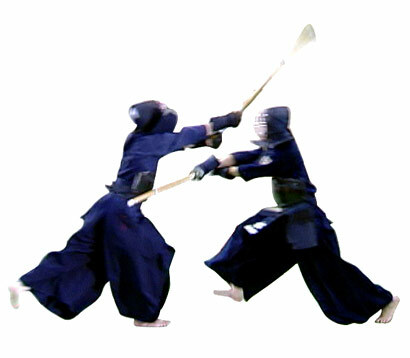 Today kendo, which means "way of the sword", is practiced with shinai (bamboo swords), and fighters wear protective equipment covering the target areas: the head, wrists, and abdomen. The bogu (protective gear) consists of a men (face mask), a do (breastplate), kote (fencing gloves), and the tare, a kind of apron to protect the stomach and hips. Under the protective gear, kendoka (students of kendo) wear a hakama, or wide split skirt, reaching the ankles. The weapon used in Kendo is the shinai, or bamboo sword. The shinai is approximately four feet in length and is made of four carefully formed bamboo slats bound together to form hollow cylinder. A cord runs along the length of the shinai. To make a valid cut a player must strike his opponent with the side opposite the cord. In addition the point must be struck with the top third of the shinai.